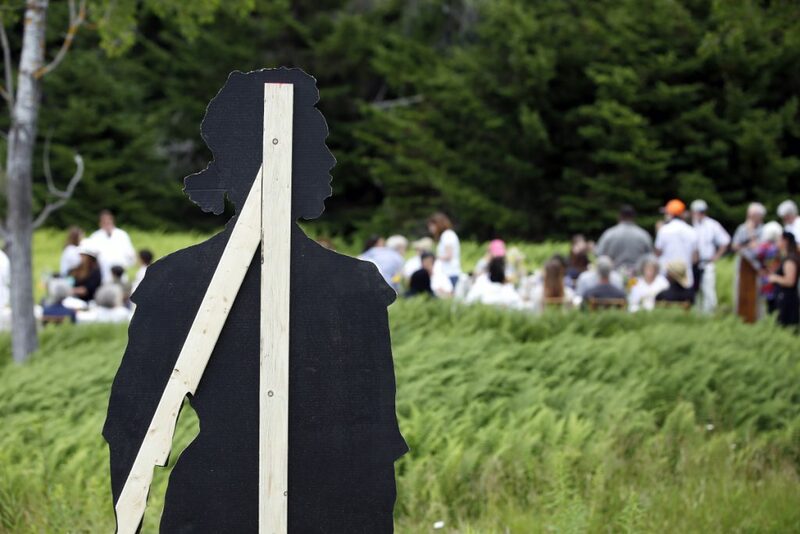 'Re:past' marries art, history and food with a one-day performance that pays tribute to the island's early settlers. He came to Bates with three degrees and a wide array of interests, having studied anthropology, cultural studies, performance and drama. 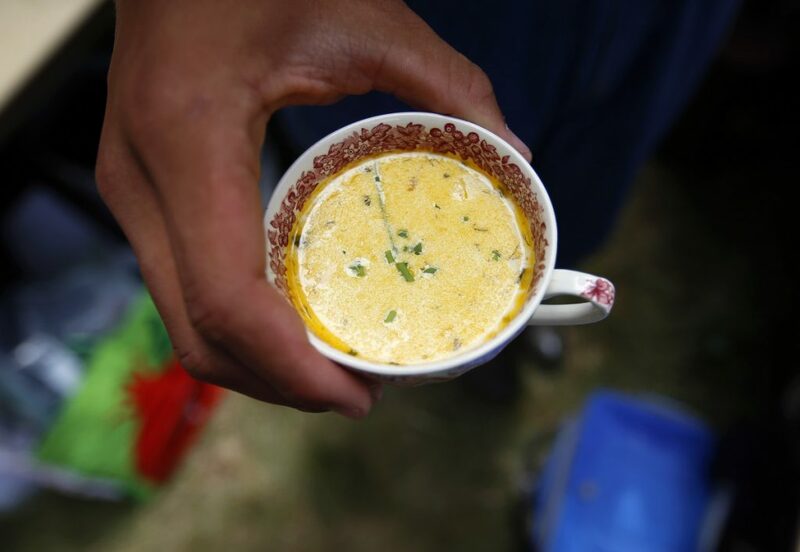 He was hired to teach in the field of American and African American cultural studies, but the work he’d do with students also included food studies. And he always knew his work would someday have to include the Malaga story. He told this story standing in a clearing on Malaga on a hot day in July, 11 years later. It was exactly 107 years and one day since Plaisted had visited the island, met the residents and deemed them unfit to continue living there as they had since the early 1860s. They had lived in an impoverished community on a beautiful island, across from another island where people more powerful were considering building a resort hotel. They were an interracial community, black, white, mixed, largely uneducated and for that, they were stripped of their homes. That was then. In the now, a feast had been prepared and two long tables set with vintage china. 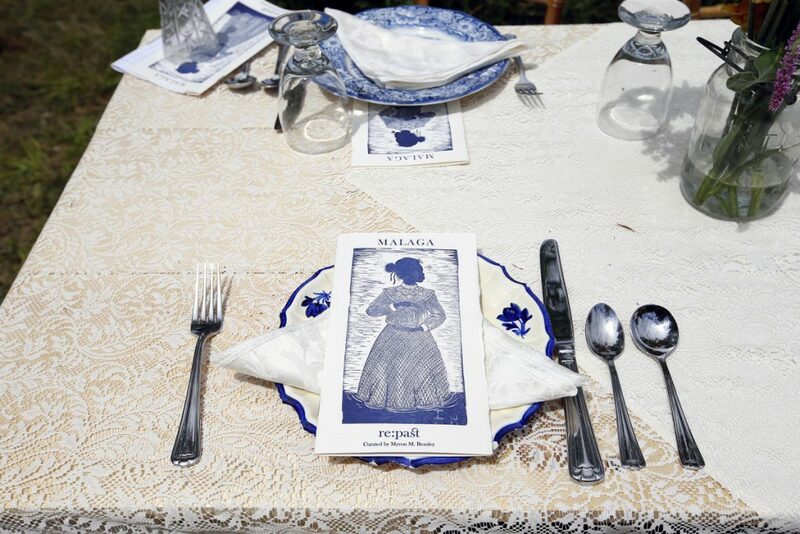 Beasley had dubbed it a “re:past” and invited just enough guests to represent the 47 residents of Malaga evicted in 1912; each was charged with calling out a name of a former islander as the dinner was served, standing in for the people of Malaga. It was a memorial and a celebration of not forgetting. “And so this is a moment that I could finally really do something with it,” Beasley said. 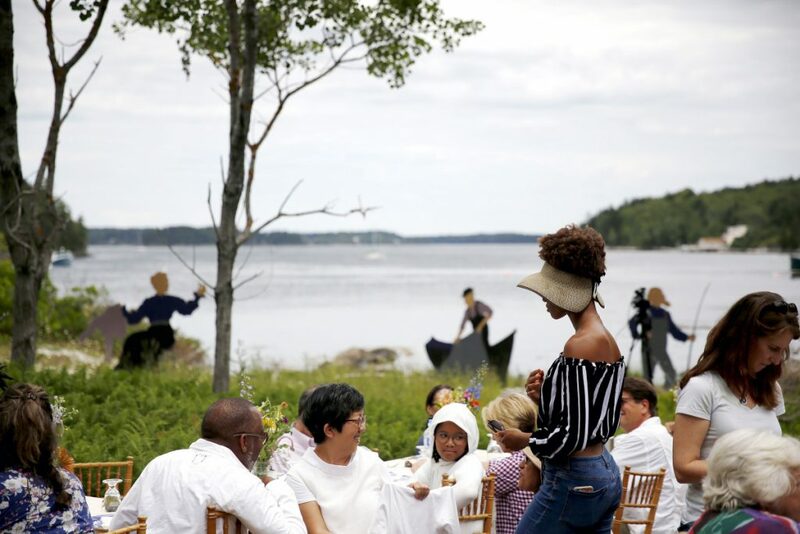 Beasley planned this performative event with the cooperation of Maine Coast Heritage Trust, the conservation group that owns the island. 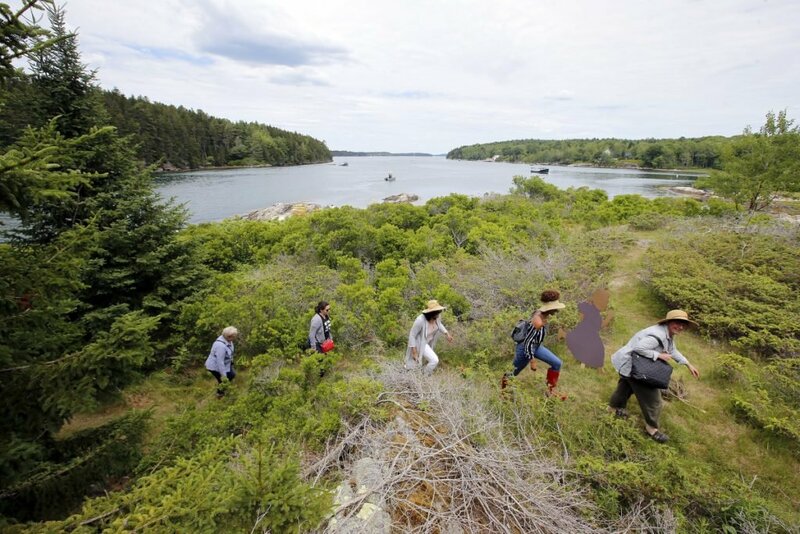 He invited a wide array of people from Maine and beyond, with various ties to the island, including descendants of the settlers, the food community, and the team of archaeologists who have been studying the island extensively since 2002. Maine legislator Craig Hickman was there, wearing a black silk robe, a straw hat and bandages. He’d burned himself just two days earlier while trying to flush out a groundhog who had been helping itself to tender Brussels sprouts on Annabessacook Farm, Hickman’s organic farm in Winthrop. His burns had been severe enough that he was flown from Lewiston’s Central Maine Medical Center to Portland’s Maine Medical Center via a LifeFlight of Maine helicopter. Chef Leslie Oster and Beasley collaborated on the “re:past” menu. 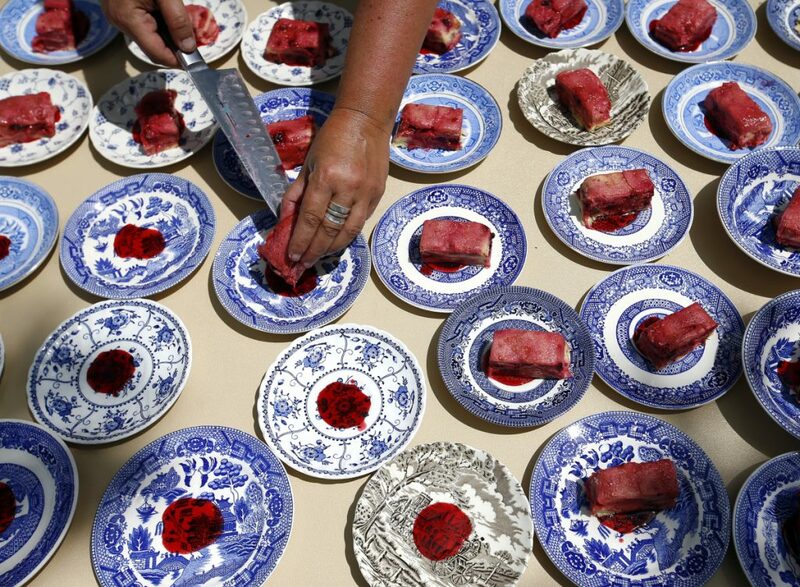 Oster, shown plating summer berry pudding, included foods that might have been common at the time, using ingredients that would have been available to islanders. 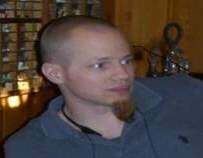 But Hickman had been so eager to fulfill the master of ceremonies role Beasley had given him that as soon as he was cleared to check out of Maine Medical Center, he’d come straight to the island, which is just off the shores of Sebasco Estates. “When Myron asks you to do something, you show up,” Hickman said. This was a popular refrain among the guests, who arrived via a shuttle from a local church and skiff to the shores of the 41-acre Malaga, where they stepped gingerly into the shallow waters and up the rocky shore. 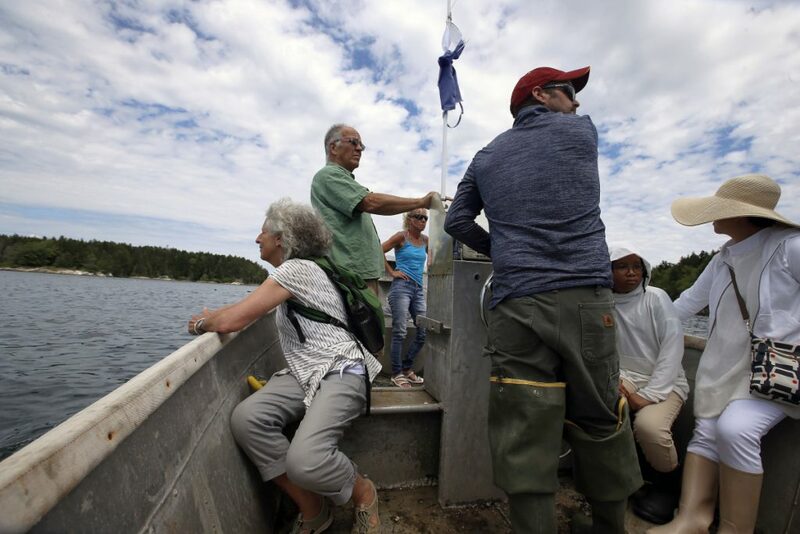 As they arrived at the site of the McKinney family house, Rob Sanford, chair of the University of Southern Maine’s Environmental Science and Policy Department, stepped out to greet them. The McKinney site looked out over adjacent Bear Island. Piles of shells lay underfoot, a testament to the family’s fishing past. 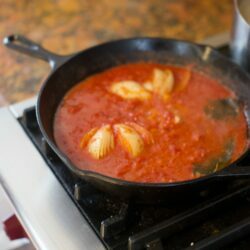 They’d picked through clams and mussels to use as bait for the longline fishing they did to make a living. Sanford, along with Nathan Hamilton, associate professor of archaeology at USM, knows Malaga better than just about anyone else living. University of Southern Maine’s archaeologists first surveyed Malaga in 1988-1989. In 2002, the duo – and their students – began seriously digging, collecting fragments and studying the lives of the island’s former residents. He led the way along a footpath to a stone circle tucked behind a tree. It was the well that the McKinney family (nine strong at the time of the eviction) would have used. Sanford said evidence remains of four wells on the island. 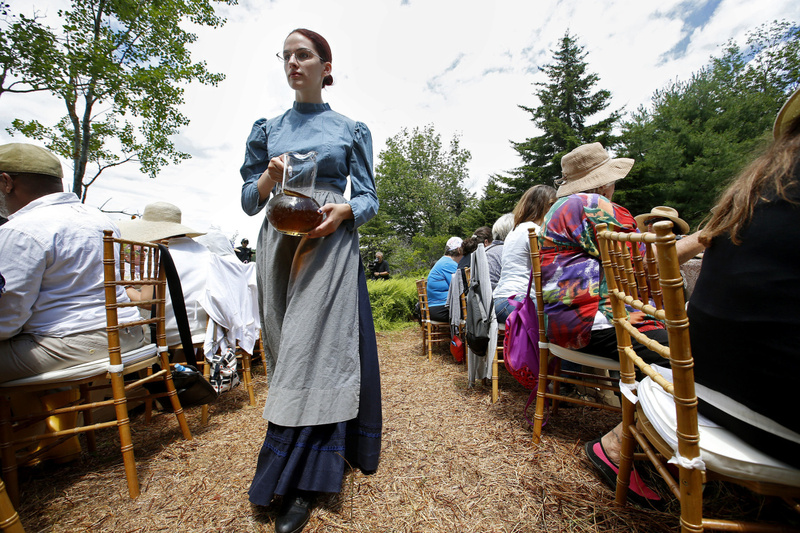 Mars Bisson, 16, of Winslow, serves Nazinscot Farm sun tea to guests at “re:past” at Malaga Island Preserve. Yet it sat there, virtually untouched, and still collecting fresh water, since the residents had been forced to leave. Most members of one of the families on the island, the Marks, were taken to the Maine Home for the Feeble-Minded (now Pineland Farms) in New Gloucester. The eight Malaga residents brought there included an 18-month old baby named Willie. After they were pushed out, the state bought the land for $471, according to Maine Coast Heritage Trust, and ordered the rest of the residents to leave by July 1. In 1913, the state sold the land to Everard A. Wilson, a friend of the doctor who had been the chair of a committee Plaisted had established to investigate the allegedly appalling conditions on Malaga. Malaga was for many years in private hands, but remained undeveloped. The hotel that had been planned for Bear Island, which Hamilton said was a key incentive for pushing the Malaga residents off the island, was never built. 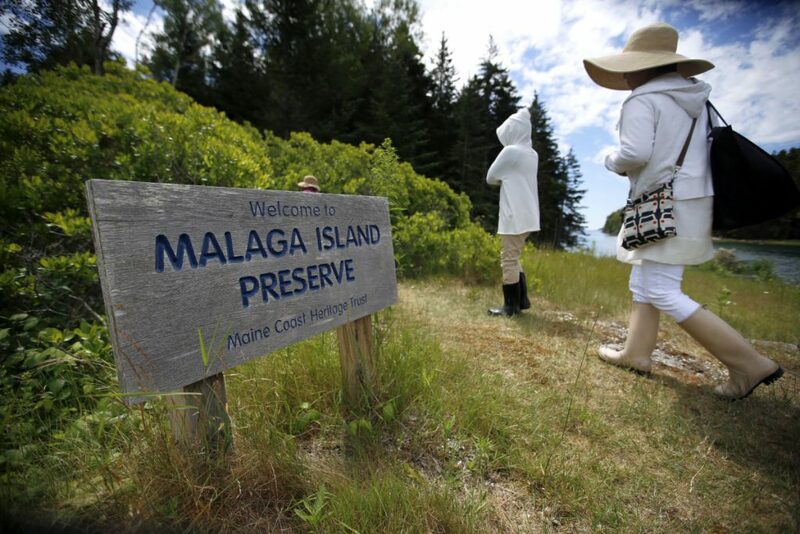 In 2001, Maine Coast Heritage Trust bought Malaga at a bargain price of $400,000, and the day the sale was announced, Hamilton and Sanford began asking for permission to do archaeological work on Malaga. Today it is a public preserve, accessible only by boat and only during the day. It’s also a teaching site for the University of Southern Maine, both for its cultural history and its environmental lessons. Hamilton said his students have taken core samples from the area between Bear and Malaga (which at extreme low tides, can be crossed) and found evidence of the era when the two islands were still joined. 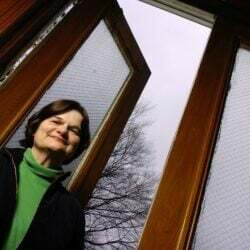 Their studies of the sea level rise of the past may, he hopes, inform how Maine coastal communities cope with today’s rapidly rising sea levels, a product of climate change. 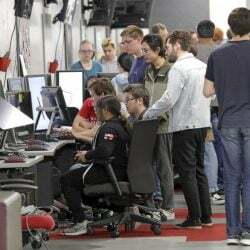 Sanford led a group, including Darra Goldstein, founder of the James Beard Award-winning “Gastronomica: The Journal of Food and Culture,” a few feet away. Goldstein, who had recently retired from being a Russian studies professor at Williams College, had traveled from Williamstown, Massachusetts, for the event (another guest who said she would not turn down any invitation from Beasley, whose work she published in “Gastronomica”). “These are the hops,” Sanford said, pointing to a vine curling up around a pile of lobster traps (fishermen use the island for some gear storage). One year, he and Hamilton picked flowers from the hops, and Sanford made a batch of Malaga beer in his garage. “In the name of archaeological research,” Sanford said. The hops, a German-style variety, would have been a crop of the islanders, who subsistence-farmed on this tough island soil. The second reason is the sturdiness of hops themselves. They’re cultivars. “People plant them, but they don’t need us anymore and they can persist for a long time,” Sanford said. 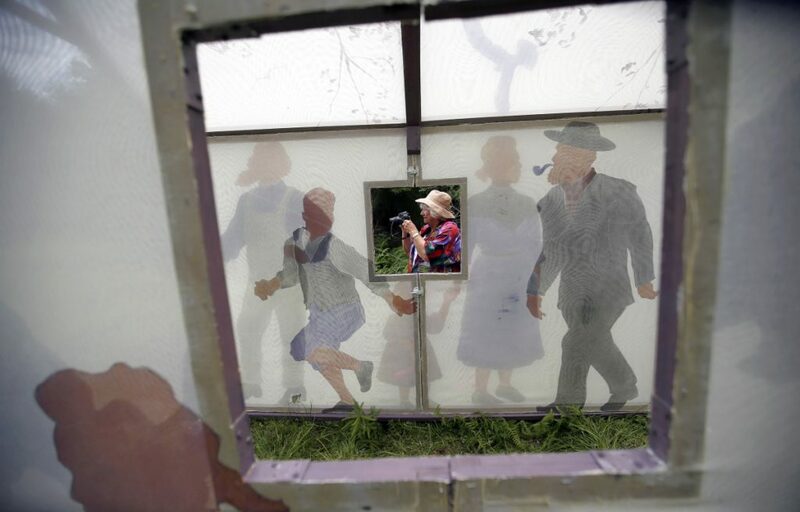 From there, the group proceeded along a path through the tall grass, passing by cutouts of characters in period dress. Michael Reidy, the managing director of theater and dance at Bates, had made them with the “re:past” assistant creative director, Saleha Belgaumi and student helpers, using sturdy cardboard for maximum effect and minimum environmental impact. He based the cutouts on archival photographs of the islanders. He’d also made screens that formed a structure that funneled the guests into the dining area. This almost house-like, but temporary “building” harkened back to the small houses, some of them shacks, none with foundations, that the original islanders lived in. Reidy said Beasley wanted to create a sense of the house structures that, in some cases, the inhabitants of the island dismantled and took with them. 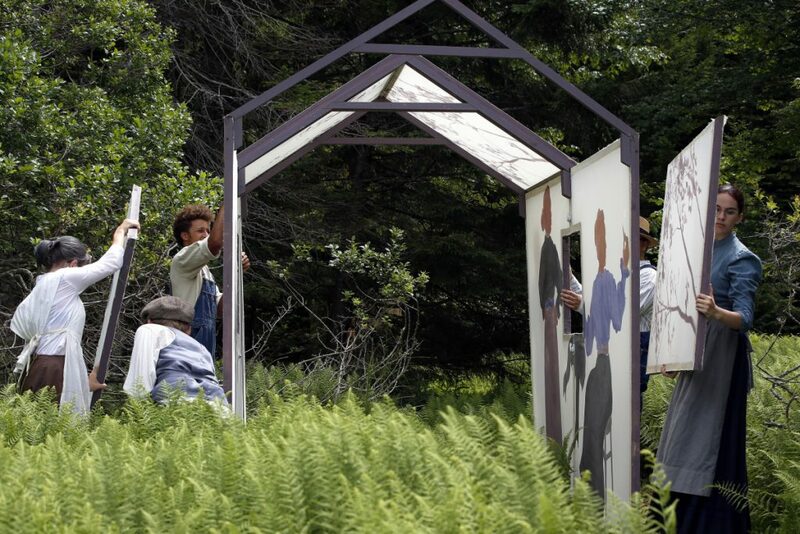 Actors disassemble an art installation that is meant to represent the demolition of the homes that belonged to the islanders before they were evicted in the early 1900s. The two long tables were decorated with flowers and a mix of plates that felt right for the period, such as blue willow. Baskets of bread waited for the guests, and even that had been curated in a sense; Barak Olins of Freeport’s Zu Bakery had offered to make a molasses bread using heritage Abenaki flint corn. As each guest sat, opening programs with a cover illustration drawn by Portland artist Daniel Minter – also in attendance – students from the Snow Pond Arts Academy in Sidney offered a choice of dry hopped cider – a direct reference to the hops they’d just seen with Sanford – or sun tea from Nezinscot Farm in Turner. 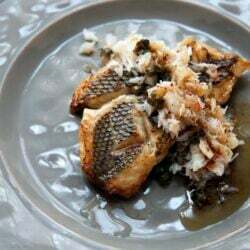 Meanwhile, behind a canvas curtain, catering chef (and former general manager of Aurora Provisions in Portland) Leslie Oster put the final touches on a menu she and Beasley had come up with over the course of several months. 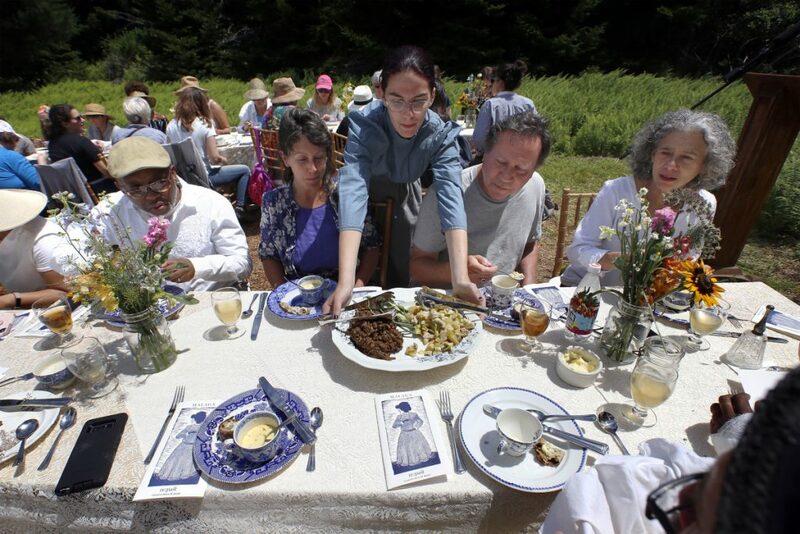 Caitlin Gerber, the regional land steward for Maine Coast Heritage Trust who oversees Malaga for the land trust, said she believed that this was the largest sit-down meal on the island since the 1912 eviction. There have been gatherings, including one of about 100 people when Gov. John Baldacci made a public apology to the descendants in 2010. But nothing like this, she said. She began working with Beasley on the project last November. He asked permission for the event and completed a commercial use permit application. 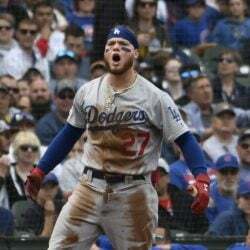 In late April, Gerber took Beasley and a group of about 11 out to Malaga, and then again in June, to get the lay of the land. 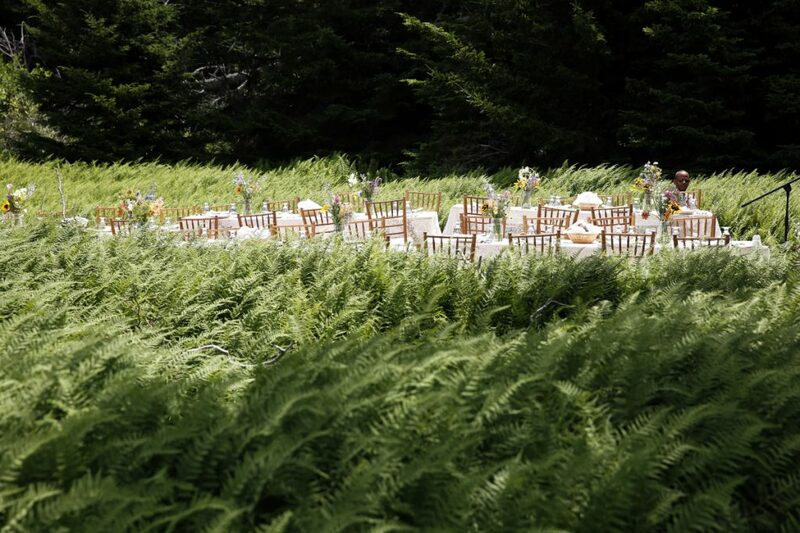 Before the event, she’d rerouted and stabilized the trail and cut some ferns, with the idea that other than that, no visible sign of “re:past” would remain when it was over. Jean Scott of West Point, who has ancestry dating back to Malaga Island and spent her youth exploring there, pauses to take a photograph next to one of the “re:past” art installations. This one, a wood frame with painted silkscreen stretched over it, was meant to evoke the homes of the island’s turn-of-the-century inhabitants. Again the crowd fell silent. The air seemed heavy, with more than just heat. “This island has a place inside of me,” he added. At the end of the afternoon, every chair, every linen napkin and every cardboard cutout were loaded back onto a pair of skiffs to be taken back to the mainland. Just as Beasley had asked that it would be, the “house” everyone had walked through was broken down, put on a boat and taken away. Malaga was left in the quiet, and a new history traveled away over the water.